The kinetics of IL-10–producing cells during acute RSV infection. At the indicated time points, cells from the lung, medLNs, and BAL of RSV-infected mice were isolated and stimulated with PMA and ionomycin, followed by intracellular cytokine staining for IL-10. 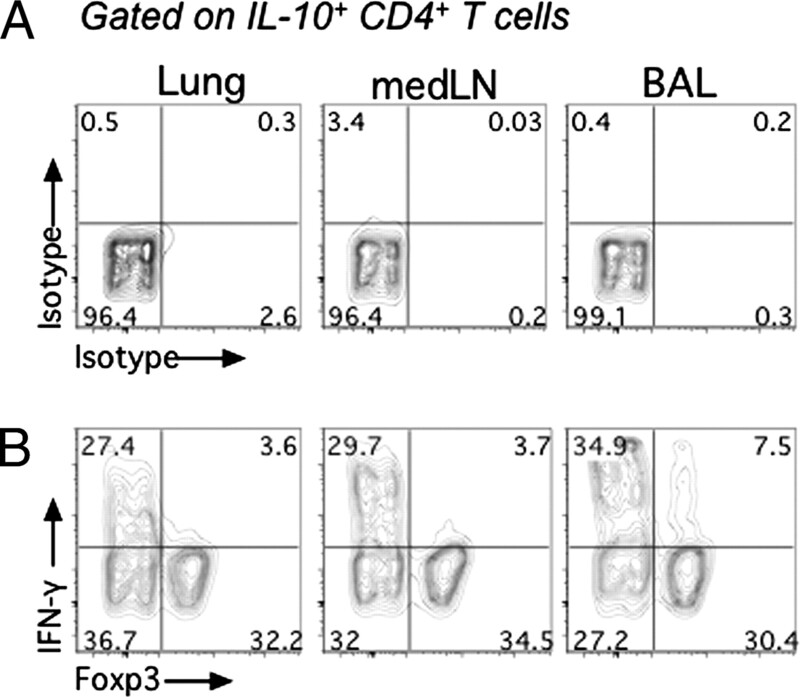 The total number of IL-10+ cells (A), IL-10+ CD4+ T cells (B), and IL-10+ CD8+ T cells (C) in the lung, medLNs, and BAL. To determine statistical significance, an ANOVA was performed with a Dunnett's post test making comparisons between each time point (days 4, 6, 8, and 10) and baseline (day 0). Cumulative data from two independent experiments are shown (n = 8). *p < 0.05, **p < 0.01. 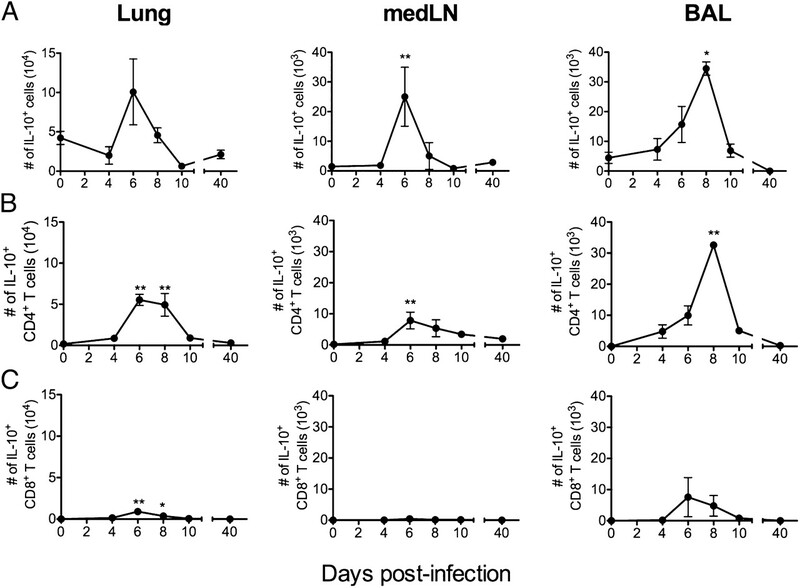 CD4+ T cells are the primary in vivo source of IL-10 during acute RSV infection. Wild-type mice were treated with depleting anti-CD4 and/or anti-CD8 mAbs or control rat IgG and subsequently infected with RSV. 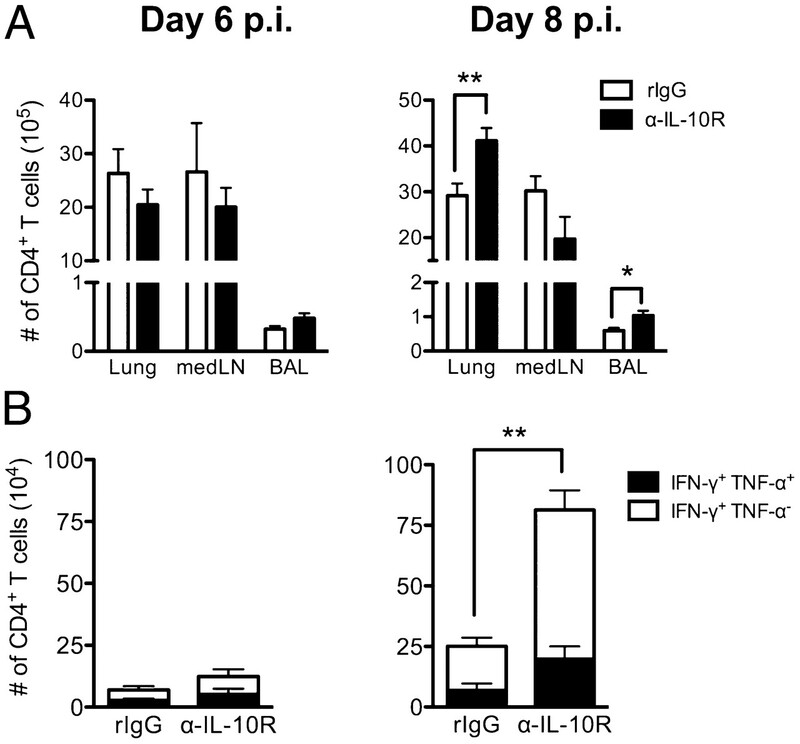 On day 6 p.i., lungs were analyzed for IL-10 (A) and IFN-γ protein (B) via ELISA. Cumulative data from two independent experiments are shown (n = 8). *p < 0.05, **p < 0.01, ***p < 0.001. n.d., none detected. Multiple CD4+ T cell subsets produce IL-10 during acute RSV infection. At day 6 p.i., cells from the lung, medLNs, and BAL were stimulated with PMA and ionomycin. Cells were subsequently stained for CD4, Thy1.2, IL-10, Foxp3, and IFN-γ. Gated IL-10+ CD4+ T cells depicting isotype control staining (A) or Foxp3 expression (x-axis) and IFN-γ production (y-axis) (B) are shown. Plots are concatenated using Flowjo software from one of two independent experiments displaying equal representation from four individual mice (n = 4). IL-10 influences RSV-induced disease severity. Weight loss depicted as the percent of initial weight and airway function (Penh) were assessed daily following RSV infection of IL-10–deficient (A) or anti–IL-10R mAb-treated mice (B). Cumulative data from two independent experiments are shown (n = 8). *p < 0.05, **p < 0.01, ***p < 0.001. IL-10 does not affect RSV replication and clearance kinetics. Lungs were harvested on days 4 and 7 p.i. from RSV-infected IL-10 KO (A) or anti-IL-10R mAb treated mice (B). RSV titers were determined by plaque assay. The limit of detection is indicated as a horizontal dotted line. Cumulative data from two independent experiments are shown (n = 8). 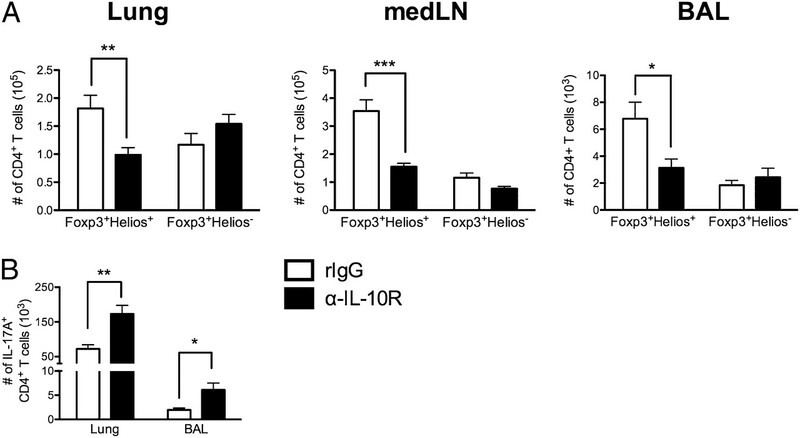 Increase in proinflammatory cytokines and chemokines in the absence of IL-10. At days 0, 4, 6, 8, and 10 p.i., lungs from IL-10 KO mice were harvested, and cytokine and chemokine protein levels within the lung supernatants were determined by multiplex cytokine array analysis. Proinflammatory cytokine (A) and chemokine (B) amounts in the lung. Cumulative data from two independent experiments are shown (n = 8). *p < 0.05, **p < 0.01, ***p < 0.001. The magnitude of the CD8+ T cell response is increased following IL-10R blockade. Mice were treated with anti–IL-10R mAb, as described in Materials and Methods. A, The total number of CD8+ T cells at day 6 (left) and day 8 (right) p.i. in the lung and medLNs. B, The total number of CD11a+ CD8+ T cells at day 6 (left) and day 8 (right) p.i. in the lung and medLNs. 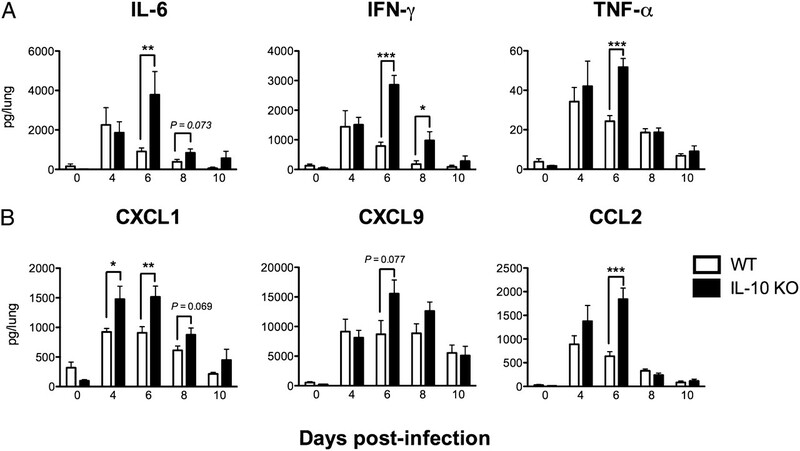 C, The total number of M282–90–specific CD8+ T cells producing only IFN-γ (closed bars) or coproducing IFN-γ and TNF-α (open bars) in the medLNs at day 6 (left) and day 8 (right) p.i. D, The total number of M282–90–specific CD8+ T cells producing only IFN-γ (closed bars) or coproducing IFN-γ and TNF-α (open bars) in the lung at day 6 (left) and day 8 (right) p.i. Data in C and D are displayed as stacked bar graphs, and the significant difference is marked for total responding cells. Cumulative data from two independent experiments are shown (n = 8). Unpaired, two-tailed Student t tests were used to compare groups. *p < 0.05, **p < 0.01, ***p < 0.001. Increased Th1 response following IL-10R blockade. A, The total number of CD4+ T cells in the lung, medLNs, and BAL at day 6 (left) and day 8 (right) p.i. B, The total number of PMA- and ionomycin-stimulated CD4+ T cells producing only IFN-γ (closed bars) or coproducing IFN-γ and TNF-α (open bars) in the lung at day 6 (left) and day 8 (right) p.i. Data are displayed as stacked bar graphs, and the significant difference is marked for total responding cells. Cumulative data from two independent experiments are shown (n = 8). Unpaired, two-tailed Student t tests were used to compare groups. *p < 0.05, **p < 0.01, ***p < 0.001. 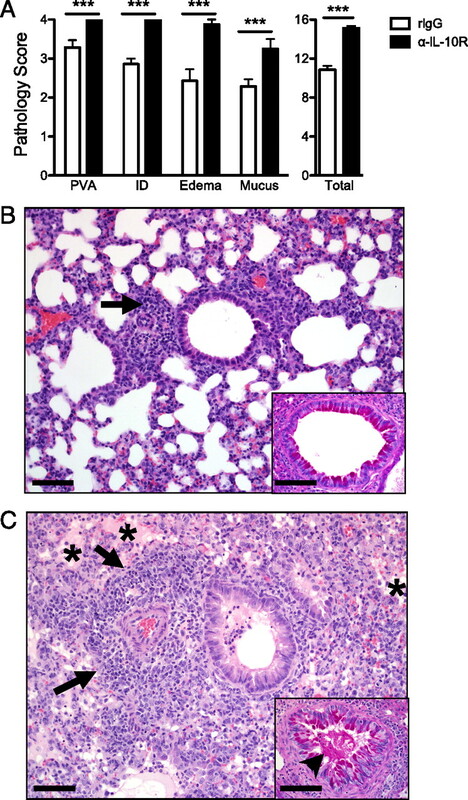 Increased lung pathology following IL-10R blockade. A, Cumulative pathological scoring analysis of sections from whole lungs of rIgG and anti–IL-10R mAb-treated mice following RSV infection. Representative H&E-stained images with PAS stain (inset: scale bar, 110 μm) from rIgG- (B) and anti–IL-10R mAb-treated lungs (C). Scale bar, 75 μm. Edema (asterisks), inflammation (arrows), and mucous cell proliferation with lumen obstruction (inset, arrowhead) can be seen. Cumulative data from two independent experiments are shown (n = 8). One-sample and two-sample t tests were used to compare groups. *p < 0.05, **p < 0.01, ***p < 0.001. Increased Th17 response and decrease in Treg response following IL-10R blockade. A, At day 8 p.i., natural Tregs (Foxp3+Helios+) and inducible Tregs (Foxp3+Helios−) were quantified in the lung, medLNs, and BAL of RSV-infected mice administered anti–IL-10R mAb. B, At day 8 p.i., Th17 cells were quantified by intracellular staining of IL-17A in the lung and BAL of anti–IL-10R mAb-treated mice infected with RSV. Cumulative data from two independent experiments are shown (n = 8). Unpaired, two-tailed Student t tests were used to compare groups. *p < 0.05, **p < 0.01, ***p < 0.001. Supplemental Figure 1 (PDF, 682 Kb) - Figure S1. CD4+ T cells represent the majority of IL-10-producing cells at the peak of RSV infection.